FULTON, NY – Members of the Greater Oswego-Fulton Chamber of Commerce joined Fulton Mayor Ronald Woodward in celebrating the grand opening of Great Lakes NY Real Estate’s new office, 183 S. Second St., with a ribbon cutting ceremony. Established in 2006, Great Lakes NY Real Estate has been serving Oswego County as well as Northern Cayuga County and Northern Onondaga County for the past four years. With a combined experience of more than 30 years, the professionals at Great Lakes NY Real Estate can handle all of your residential, land and commercial real estate needs. 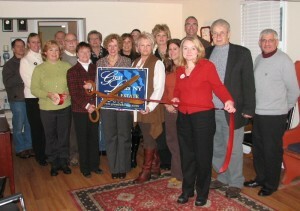 From the left are: Mark Capolla; Stephanie-Barrus Stone, sales agent; Lisa Gray, membership sales and services associate for the chamber; Kurt Ferris, chamber membership committee; Don LaBarge; Charlene Avrich, Great Lakes NY broker-owner; Diane Burnell; Sue Fiorini, broker–owner; Linda Thomas-Caster, chamber board member; Morgan Burnell; Shelly Sachell, broker-owner; Sandra Farrands; Michelle Kearns, sales agent; Jamie Persse, chamber board member; Beth Hilton, executive director of the chamber, Fulton Mayor Ronald Woodward and Paul Ketchum, sales agent.